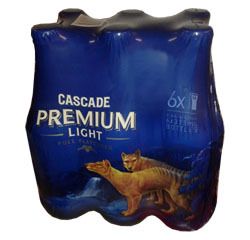 Cascade Premium Lager is the original Tasmanian premium beer from Australia's oldest continually operating brewery in the foothills of Mount Wellington in Hobart. Cascade's brewers combine traditional brewing skills and the purest mountain water with the best of Tasmania's barley and Pride of Ringwood hops to create the purest beer in the country. Renowned for its legendary taste and exceptionally smooth, full flavour, it's the longer than usual maturation (extended lagering) that develops elegant fruit flavours, and a full mid-palate lingering to a crisp, spicy hop finish. The result is a beer of distinction to suit the most discerning palate. Cascade Premium Lager is one of Australia's most awarded beers, more recently endorsed by a panel of respected beer experts at the inaugural Australian Good Taste Beer Awards 2003 - taking out top honours in a highly competitive field, winning the gold medal for 'Best Premium Beer in Australia'.